Research areas: a forest entomologist and phythopathologist conducting research in the field of forest entomology, forest protection and biodiversity conservation with emphasis placed on bark beetles (Scolytinae) and other xylophilous beetles, ladybirds (Coccinellidae) and invasive insect species. A keen birdwatcher. Biologia, 73 (11), pp. 1053-1066, 2018, ISSN: 0006-3088. Excessive mortality of Scots pine (Pinus sylvestris) trees has recently been observed in the Záhorská nížina lowland in western Slovakia, Central Europe. Continuous drought, bark beetles and blue-stain fungi are likely to play a crucial role in this dieback of pines in a warm sandy area. Two blue-stain fungi, Ophiostoma ips and Ophiostoma minus, were found here on Scots pine trunks infested by bark beetles. These fungi were isolated and identified based on morphological properties and DNA sequences (ITS, LSU, β-tubulin). They colonized the inner bark, phloem and blue-stained sapwood, and were recorded in the galleries of Orthotomicus longicollis and other species of this genus. The occurrence of O. minus was massive; the fungus was found to produce perithecia abundantly in dying pines. Detailed descriptions, illustrations and global distribution of the two fungal species on host pine species are provided. The records of O. ips and those of O. minus are new for the mycoflora of Slovakia. Undetermined mycophagous nematodes were found inside the perithecia of O. ips. 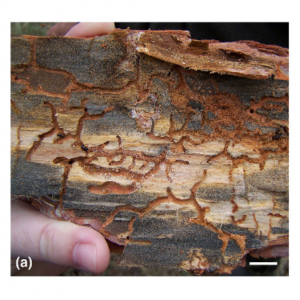 The role of bark beetles as real and potential vectors (Ips spp., Orthotomicus spp., Tomicus spp., Hylurgus ligniperda, Hylastes sp.) of blue-stain fungi in a declining pine forest is discussed. Journal of Invertebrate Pathology, 155 , pp. 52-54, 2018, ISSN: 0022-2011. We evaluated the presence and impact of Entomophaga maimaiga on both target and non-target phytophagous larvae. 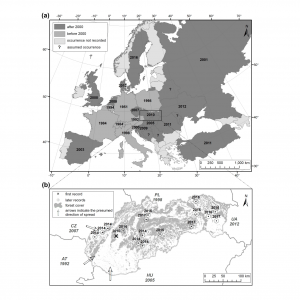 All six study plots, with low gypsy moth population density, were situated in Central and Southeastern European oak forests and E. maimaiga had previously been reported from these plots. Totally, 45 of 4,045 (1.13%) collected non-target larvae died due to fungal infections. No non-target insect specimen was infected by E. maimaiga, although the presence of the pathogen could not be fully excluded in three cadavers. Out of 1,780 L. dispar larvae collected, 15 individuals (0.84%) were infected by E. maimaiga. Plant Protection Science, 54 , pp. 272-283, 2018, ISSN: 12122580. BioControl, 62 (3), pp. 409-421, 2017. We evaluated the status of native ladybird assemblages in the presence of the non-native ladybird Harmonia axyridis Pallas (Coleoptera: Coccinellidae) in three European countries. 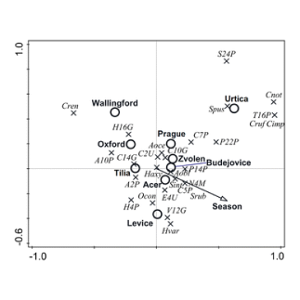 To achieve this, we assessed the abundance of ladybirds from common host plants in urban areas of Great Britain, Czech Republic and Slovak Republic in 2014. We determined (i) the effects of season, host plant, location, abundance of H. axyridis and aphids on the ladybird species assemblage, (ii) the relationship between ladybird abundance and aphid density, (iii) the relationship between diversity of native ladybird species and the abundance of H. axyridis. 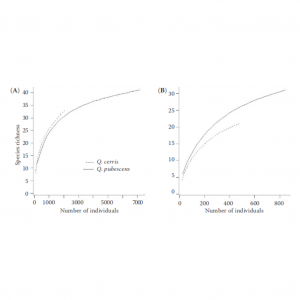 There was a non-linear relationship between abundance of ladybirds and abundance of aphids but we found the abundance of other ladybird species was not correlated with H. axyridis. We highlight the value of large-spatial scale studies for revealing patterns in community assemblages and ultimately informing understanding of ecosystem resilience. International Journal of Acarology, 42 (4), pp. 212-217, 2016, ISSN: 1945-3892. Mites of the genera Trichouropoda and Uroobovella are characteristic associates of bark beetles which act as agents of their dispersal in many types of forest ecosystems worldwide. We compared the phoretic assemblages of Trichouropoda and Uroobovella mites on six species of bark beetle associated with Norway spruce (Picea abies (L.) Karsten), namely: Dryocoetes autographus Ratzeburg, Hylastes cunicularius Erichson, Hylurgops palliatus (Gyllenhal), Ips typographus (Linnaeus), Pityogenes chalcographus (Linnaeus) and Polygraphus poligraphus (Linnaeus). 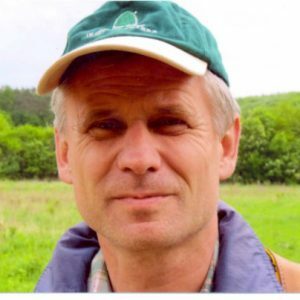 Bark beetles were caught at random in non-baited flight-interception traps set in the shrub layer of a declining mountain spruce forest in the Tatra Mountains, West Carpathians, Central Europe. Over four years of a bark beetle outbreak, a total of six species of mites and 12 phoretic associations between mites and beetles were recorded. A newly documented host association includes that of Trichouropoda pecinai Hirschmann & Wiśniewski with H. palliatus. The most frequently recorded mite-beetle associations were: T. pecinai with H. cunicularius, Trichouropoda obscura (Koch) with H. palliatus, Trichouropoda polytricha (Vitzthum) with P. chalcographus and I. typographus and Uroobovella vinicolora (Vitzthum) with D. autographus. The results suggest that most of the recorded mite species have distinct bark beetle dispersants and that niche partitioning in these dispersants may be reflected by the observed mite–host associations. Environmental Entomology, 45 (2), pp. 436-445, 2016. Lepidoptera associated with Norway spruce, Picea abies (L.) Karsten, play important roles in ecosystem processes, acting as plant pests, prey for predators, and hosts for parasites and parasitoids. Their distribution patterns in spruce crowns and forests are only poorly understood. 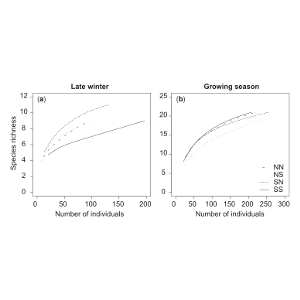 We examined how slope and crown aspect affect the occurrence and abundance of moth larvae on solitary spruce trees in a montane region in Central Europe. Moth larvae were collected from southern and northern crowns of trees growing on south- and north-facing slopes (four treatments) using emergence boxes at the end of winter and by the beating method during the growing season. 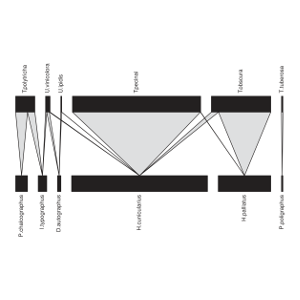 Species responses to slope and crown aspect were not uniform. Treatment effects on moth larvae were stronger in the winter than during the growing season. In winter, the abundance of bud-boring larvae was significantly higher in northern than in southern crowns regardless of the slope aspect, while both slope and aspect had marginally significant effects on abundance of miners. During the growing season, the occurrence of free-living larvae was similar among treatments. Emergence boxes and beating spruce branches are complementary techniques providing valuable insights into the assemblage structure of moth larvae on Norway spruce. Due to the uneven distribution of larvae detected in this study, we recommend adoption of a protocol that explicitly includes sampling of trees from contrasting slopes and branches from contrasting crown aspect in all seasons. Biological Invasions, 18 , pp. 997-1044, 2016, ISSN: 1387-3547. The harlequin ladybird, Harmonia axyridis (Pallas) (Coleoptera: Coccinellidae), is native to Asia but has been intentionally introduced to many countries as a biological control agent of pest insects. In numerous countries, however, it has been introduced unintentionally. The dramatic spread of H. axyridis within many countries has been met with considerable trepidation. It is a generalist top predator, able to thrive in many habitats and across wide climatic conditions. It poses a threat to biodiversity, particularly aphidophagous insects, through competition and predation, and in many countries adverse effects have been reported on other species, particularly coccinellids. However, the patterns are not consistent around the world and seem to be affected by many factors including landscape and climate. Research on H. axyridis has provided detailed insights into invasion biology from broad patterns and processes to approaches in surveillance and monitoring. An impressive number of studies on this alien species have provided mechanistic evidence alongside models explaining large-scale patterns and processes. The involvement of citizens in monitoring this species in a number of countries around the world is inspiring and has provided data on scales that would be otherwise unachievable. Harmonia axyridis has successfully been used as a model invasive alien species and has been the inspiration for global collaborations at various scales. There is considerable scope to expand the research and associated collaborations, particularly to increase the breadth of parallel studies conducted in the native and invaded regions. Indeed a qualitative comparison of biological traits across the native and invaded range suggests that there are differences which ultimately could influence the population dynamics of this invader. Here we provide an overview of the invasion history and ecology of H. axyridis globally with consideration of future research perspectives. We reflect broadly on the contributions of such research to our understanding of invasion biology while also informing policy and people. Fragmenta Faunistica, 58 (1), pp. 51-58, 2015. Opiliofauna of open biotopes in the Poloniny National Park (NP) is presented. The biotopes include the variably utilized or successively overgrowing grasslands. During the period 2011–2013, we found 21 species of harvestmen which represent 60% of the Slovak opiliofauna. The highly eudominant species was Phalangium opilio. The open and sunny biotopes as meadows and pastures proved to be typical habitats for P. opilio and Oligolophus tridens. Other dominant species were: Trogulus nepaeformis and Lacinius ephippiatus. The Carpathian endemics: Paranemastoma kochi and Ischyropsalis manicata as well as thermophilic species Egaenus convexus, Lacinius horridus and Zachaeus crista were also found in the study sites. Annals of Forest Research, 58 (1), pp. 185-190, 2015. Wind storms play an important role in structuring European forests, however, the direct effects of strong wind on insects roosting in tree canopies are poorly known. In this study we assess the proportion of moth larvae which remain on Norway spruce (Picea abies [L.] Karst.) trees which have fallen during high winds. Next, we contribute to the knowledge of potential importance of such larvae in forests fragmented by local wind damage. We studied the effects of wind in spruce forest in the West Carpathians in March 2013. Branches were sampled from randomly chosen fallen and standing (undamaged) spruce trees in April 2013. 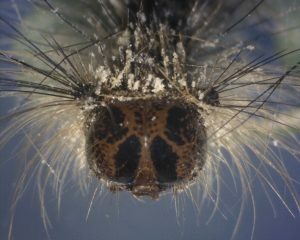 Larvae or emerged moths were obtained from branches in the laboratory using photoeclectors. Assemblages of larvae were analysed at community level using several approaches. In total, 11 species of Lepidoptera were found on the branches, 10 of them overwinter as larvae and one as eggs. No differences were observed between abundance and species richness of larval assemblages on fallen and standing trees. Assemblages were very similar; there was no difference detected between standing and fallen trees. Overwintering larvae can successfully complete their development on wind-felled trees; hence, the emerged moths may contribute to greater infestation of standing spruce trees surviving wind disturbance. Zookeys, 412 , pp. 89–112, 2014. Folia Oecologica, 40 (1), pp. 84-90, 2013, ISSN: 1336-5266.
recorded in the middle trunk sections. However, the four of them, I. sexdentatus, P. piniphilus, T.
mixed oak-pine forest in Central Europe. Polish Journal of Ecology , 60 (3), pp. 601-609, 2012. Folia Oecologica, 38 (1), pp. 52-56, 2011, ISSN: 1336-5266. Windstorm on November 19, 2004 seriously affected Norway spruce (Picea abies) forests in Tatra Mountains, Northern Slovakia. We studied as to whether moth larvae and eggs overwintered successfully on branches of uprooted spruce trees. Also, we evaluated differences in assemblage structure of overwintering developmental stages of moths between the upper and middle crown area of wind-felled spruce trees. In May 2005, we sampled branches from a total of 12 wind-felled trees in Tichá dolina valley in the altitudes between 1,020 and 1,050 m. From each tree, a total of 30 branches were collected from both its upper and middle crown area. In addition, a total of 400 cones were sampled from the wind-felled trees. Moth larvae or hatched adults were obtained from branches or cones through photoeclectors in the laboratory. Larvae of one species developing in cones (Cydia strobilella), 3 species of bud-borers (Argyresthia glabratella, A. amiantella, A. bergiella), 7 needle spinning species (Batrachedra pinicolella, Chionodes electella, Syndemis musculana, Dichelia histrionana, Pseudohermenias abietana, Epinotia tedella, E. nanana), one free living species (Thera variata) and one species feeding on lichens or algae (fam. Psychidae – Naryciinae, not identified) were recorded. The moth Zeiraphera griseana was the only species overwintering in the egg stage. Branches of uprooted spruce trees hosted all moth species common on living standing spruce trees in other mountain valleys of Tatra Mountains. Specimens of needle-spinning species overwintering in the larval stage were collected in significantly greater numbers on the upper crown than on the middle crown branches of the individual wind-felled trees (p < 0.05, Wilcoxon matched pairs test). In bud-borers, such significant differences were not found. The numbers of moth specimens belonging to the rest feeding groups were low. Successful development of all moth species overwintering on uprooted trees in the larval stage (13 species) was highly likely. Most larvae of Z. griseana emerging from eggs in spring, possibly, died because of the lack of opening buds and young needles on most fallen trees which were drying out gradually.